Oneworld Racing Pty Ltd :: BOOGI NIGHTS! A big win on Friday night from the ever consistent I Boogi showed he is in for a top summer campaign after his barnstorming finish in the seventh race on the programme. The son of Iffraj was resuming from a spell and under the guidance of top in form hoop Jordan Childs, I Boogi came from last at the top of the straight to claim victory in a thrilling finish. I Boogi has always shown above average ability and has now won two races in the metropolitan area and looks like he will advance quickly to Saturday level within the coming weeks. Cameron Racing which is headed up by the father and son team of Russell and Scott Cameron who look like they are in for a 'good time' over the summer months as they have a nice little team behind them. I Boogi has now won in excess of $100k in stake and will add to that money very quickly once he steps out shortly. 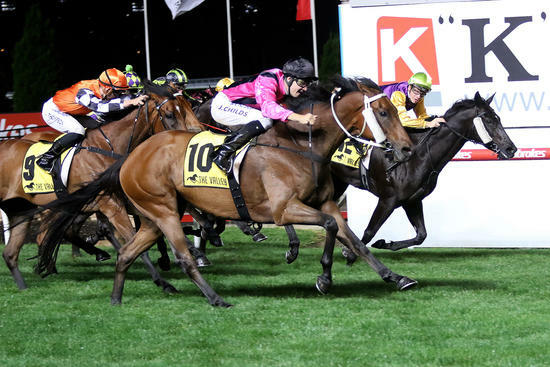 Congratulations to the winning connections of I Boogi who are based in New Zealand, to Russell and Scott Cameron on a great training effort and to I Boogi's strapper in Alex who does a fantastic job with the horse.